Today is our 2,631st day in Iraq and our 3,159th day in Afghanistan. This morning....the day after Memorial Day...we find this morning's cost of war passing through a new milestone. It's been a long time coming, but nevertheless it's a tough number to take. On March 11, 2008 the counter stood at just half that total. It's been 812 days since then, for an increase of about $612, 763, 546.00 per day. Small wonder the economy is in the shitter. Did you happen to catch the right's latest false flag operation? I only saw it in passing myself, but I have no idea how much print and airtime was devoted to President Obama's "snub" of veterans, by way of his making a speech at a national cemetery in Illinois instead of at Arlington. 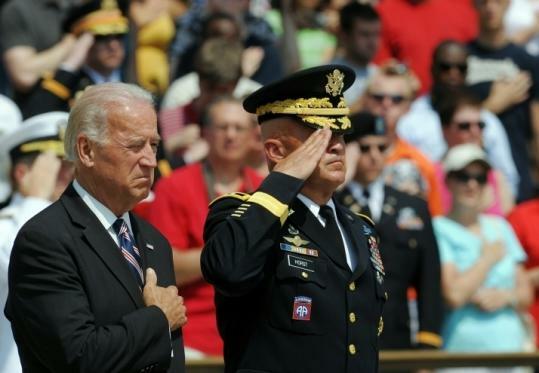 Of course the administration was represented by Vice President Joe Biden. The ceremonies at Arlington are a mid 20th century innovation; this is not a centuries-old cherished tradition. The Right of course had no problem whatsoever when Bush the younger was out of the country (once), Bush senior sent his Vice President (all four years) or hell, when the sainted Reagan laid a wreath at a Nazi SS Cemetery. But, I digress. Ah, but there is a battle worth fighting over Memorial Day. Something we all take for granted...do you have a US Flag flying outside your house right now? Do you just assume that you can just hang one up anywhere, anytime and be done with it? A veteran in Wisconsin has been told that he has to take his flag down. (warning: Fox Link.) He doesn't own his own home, and his apartment association has rules banning the display of any flags or banners. "This has been eating at us since Friday," she said. 'The best way to fight this isn't getting an eviction and going after these people in court. That's just going to cost us a lot of time, energy and money." "We don't want to fight the eviction," she said. "We know we'd lose." "He actually sees it as a slap in the face to his service," she said. "He's pretty upset about it, especially right around Memorial Day." So it appears that some of those freedoms that our troops are 'fighting to defend' still need some work.